If you look at a map of Montréal, you’ll notice that there are two bridges connecting downtown to the south shore. So you can be closer to the city centre being off island than on it. So, is it a good idea to be off island? The catch of course are the bridges, they become bottlenecks during rush hour, although we’ve yet to see any really serious traffic problems. Yet on the island there is a lot of traffic going out to the west and north to Laval. Several sources have commented that Brossard and Longueuil have nice parts, but attracted some undesirables that have lead these areas to be a bit “Rock and Roll” as they say here, with some gang activity. Indeed, there are some really nice sectors in these towns and some really not so nice ones. We came across a mini trailer-park in Longueuil as well as a really nice estate. So a bit of a mix. Where you have to be really careful is if you have children. The school system in Québec does not let parents chose the school their children attend. They must go to the one designated by the schoolboard (call to check). It’s hard to know in advance what the make up of the school will be, so if you’d like to buy a house in Brossard or Longueuil, call up the school board Commission Scholaire Marie-Victorin and the head teacher of the school and ask what it’s like. Hence, our decision was to focus on La Prairie and Boucherville which are both 95% French speaking Québécois communities with good schools, few social problems, parents who support and are involved with their children. 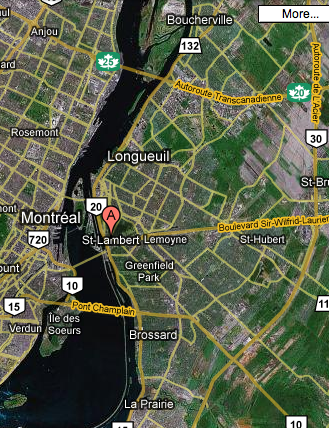 Saint Lambert is a small town that is part of Longueuil just at the bottom of Jacques-Cartier bridge. The houses there are older and quite expensive. You can get more for your money in other areas of the south shore. Longueuil is generally expensive; Brossard a bit cheaper. Greenfield Park is also expensive and is home to an International school with a good reputation – however they take students via an exam at 5 years old. Saint-Hubert is further out, the houses are quite big and there is more land around them. There are a lot of newer properties; but the feeling we had was that the houses were less well maintained than in other areas. Boucherville is the greenest most wooded area and is clearly very attractive. Parts of Brossard are very green too, but areas of new development are often very dull: houses are very similar and there are few trees. La Prairie has a lot of new houses, but it has managed in general to maintain the character of the area in keeping mature trees and mixing many different house styles. Let us know what your experiences of the south shore are but using the comments section below! Today we passed through La Prairie to have a quick look. The town is on the bank of the Saint Laurent just east of Brossard. The old centre is quite pretty with a few shops, the rest is standard strip malls. We saw some suburbs that looked pretty good, very similar to Brossard, although we noticed that the gardens seemed slightly less well kept than those of Boucherville.